If you love chicken fajitas and you love burgers then you're really going to love this new Chicken Fajita Hamburger recipe. Talk about the best of both worlds. Combine the usual fajita ingredients, chicken, green chili's, onion, Monterrey jack cheese, salsa and guacamole but make it into a hamburger instead! You'll find these particular hamburger patties are very moist when you're making this recipe but they firm up very quickly on the grill and lose a little of that moisture. I'm positive you could substitute ground turkey instead of the chicken in this hamburger with no loss of flavor. I also know you can substitute the packaged fajita seasoning mix with 2 1/2 tablespoons of Cajun Seasoning recipe found here. 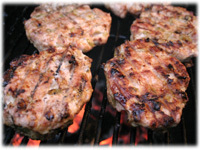 To give these burgers a more authentic restaurant fajita taste try a drop of liquid mesquite smoke flavoring as you mix the meat. Variation: If you can't find packaged Fajita Seasoning this Cajun Seasoning recipe will also work, use 2 1/2 tablespoons instead. Sautee the onions in 1 tablespoon of butter over medium heat until they're soft and turning golden brown. 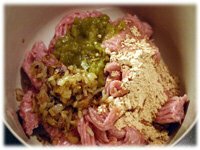 In a large mixing bowl combine the ground chicken, sauteed onion, green chilies and fajita seasoning. Wet your hands with water and gently combine the ingredients. 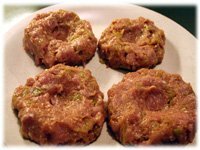 Shape approximately 1/2 to 3/4 cup of the hamburger mixture into patties 1/2 to 3/4 inches thick. Don't worry if the mixture feels very wet when your making these patties, they firm up and lose some moisture as they're grilling. Clean and oil the grates of the BBQ well. 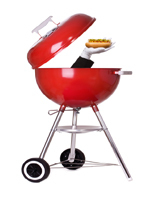 When the grill reaches temperature put the burgers on and close the lid. 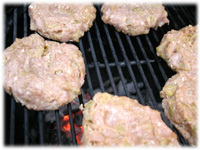 After 5 - 7 minutes lift the lid and rotate each hamburger 45 degrees on the grates and close the lid. After another 5 - 7 minutes flip each hamburger over and close the lid. After another 5 - 7 minutes lift the lid and put about a 1/4 of shredded Tex Mex cheese on each hamburger patty and close the lid. After another 5 - 7 minutes lift the lid and check that the cheese is melted. 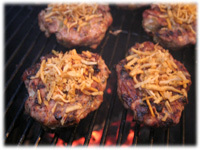 These burgers takes between 20 and 25 minutes to cook - if you check the internal temperature it should be at least 165F. 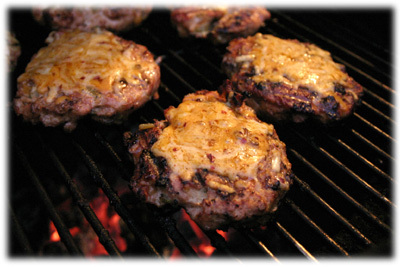 Remove the burgers from the grill and let rest for 5 minutes. 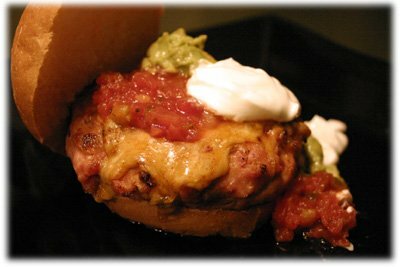 Place the sour cream, salsa and guacamole in serving bowls to be used as condiments on the burgers. Consider different toppings like roasted red peppers or different buns or tortilla wraps instead.